Father Nicholas Smith led the Kombey family — from left, Medard, Penouel and Felicity — as they offered the gifts at a multicultural Mass at the Cathedral Basilica of Saint Louis on May 23. Bishop Mark S. Rivituso celebrated the Mass with readings, universal prayers and music in several languages and signed by an interpreter. The Kombeys are parishioners at Christ the King Parish in University City. Photo Credit: Jerry Naunheim Jr.
A multicultural Mass at the Cathedral Basilica of Saint Louis on the Feast of St. Toribio Romo was right up the alley for two communities of women religious from Vietnam. The communities, the Lovers of the Holy Cross of Hanoi and Our Lady of Unity of Bac Ninh, have sisters visiting and studying in St. Louis as guests of the School Sisters of Notre Dame in south St. Louis County. They participate in a formal English language immersion program the SSNDs designed for them. Six of the Vietnamese sisters danced at festivities in front of the cathedral basilica before Mass. They also were part of a choir that sang at Mass. The activity outdoors drew several onlookers. Ryan Starks-Thomas, a local artist who attends a Baptist church, took out his phone and snapped several selfies with the Vietnamese dancers and with matachines from Holy Trinity Parish in St. Ann. Also enjoying the diversity were two people from Iran who walked over from nearby apartments when they saw the activity. “Seeing people gathered together from different backgrounds is exciting,” said Payam Lashkari, whose work brought him to St. Louis several months ago. 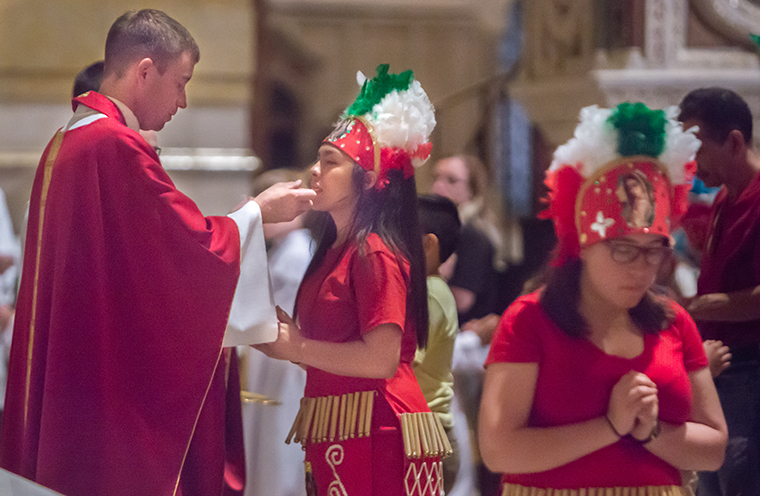 Father John O’Brien, pastor of Our Lady of Guadalupe Parish in Ferguson, distributed the Eucharist at a multicultural Mass at the Cathedral Basilica of Saint Louis May 23. The Mass was celebrated on the Feast of St. Toribio Romo, the patron of immigrants. Photo Credits: Jerry Naunheim Jr.
Another member of the parish in House Springs, Terry Oslund, said it showed that the Church is universal. “We’re able to take a trip around the world without having to leave St. Louis,” she said. The archdiocesan Office of Sacred Worship and Office of Hispanic Ministry along with the Peace and Justice Commission organized the Mass and festivities on the feast of the patron saint of immigrants. They invited attendees to wear traditional attire of their homelands. Giovanni Madriz of the Office of Hispanic Ministry spoke at the outdoor festivities, urging people to introduce themselves to the other attendees. Auxiliary Bishop Mark Rivituso, celebrant of the Mass, asked people to recognize the beauty of the Church in its diversity. The variety of customs “make the Church so rich,” he said. Real love seeks to better the lives of others, he said. It involves overcoming fear and takes courage, he added, citing the need to stand up to counter unjust immigration policies, for example. “We must be strong enough to confront injustices and reverse hatred in this country,” he said. Patrick Thimangu, who came to the United States from Kenya, brought his children so they could see the many cultures within the Catholic Church. Several other families attended with their children. “It’s great to see how we’re all connected and can come together for our beliefs and faith,” Thimangu said.